I have been watching project runway (reruns I think) which is a guilty pleasure for me since I usually disdain the TV set as a total waste of time. Anyway. An episode I saw recently was entitled "inspiration". All the designers were given digital cameras and let loose in NYC to run around taking pictures. Then they had to use one picture as inspiration for an outfit. One guy made a sensational dress and his inspiration was a photo of New York City gutter water! I thought it was amazingly creative. 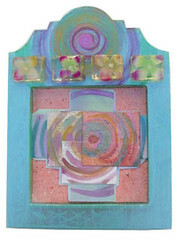 Original miniature collage painting in an assemblage picture frame. 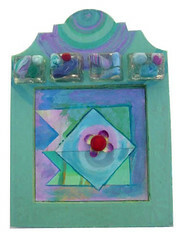 The work incorporates dyes, lumiere metallic paints, an artificial flower, a vintage button and Polymer resin tiles with handmade polymer clay beads embedded inside. The frame was totally different until I altered it to become what you see here, although you can still see a bit of its original texture & decoration peeking through. There is a tiny spin painting on the top of the frame~ it is totally hand painted. Would be a fantastic decorative addition to your home, office, cubicle, or locker...would also make an incredible Christmas or holiday gift for the drama queen in your life. 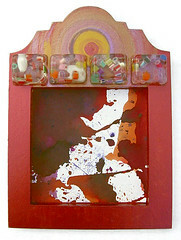 Original miniature collage painting in an assemblage picture frame. The work incorporates dyes, lumiere metallic paints, my own handmade/hand recycled paper, and Polymer resin tiles with handmade polymer clay beads embedded inside. The frame was totally different until I altered it to become what you see here, although you can still see a bit of its original texture & decoration peeking through. There is a tiny spin painting on the top of the frame~ it is totally hand painted. This is an Original, One of a Kind Mixed Media Collage Painting. This piece has multiple layers and lots of texture. It incorporates my own handmade/hand recycled paper, Japanese Washi paper, and my own hand dyed, hand painted papers. The focal point is a small original spin painting. The papers have various wrinkles, crinkles and textures which creates visual richness. Original framed miniature collage/painting/assemblage. This piece is part of my new "Youth" Series. The work incorporates dyes, lumiere metallic paints; vintage buttons and a bead (both plastic and glass); sewing thread~ the embellishments were sewn by hand onto the collage~ Polymer resin tiles with little tiny Guatemalan "Worry Dolls" embedded inside (the worry dolls used to be attached to a barrette that I wore a lot when I was in college~ I think the barrette really was from Guatamala but at this point I can't remember for sure); and the frame was totally different until I altered it to become what you see here, although you can still see a bit of its original texture peeking through. The paintings that make up the collage are my own original artwork, including the tiny spin paintings~ they are hand painted. The dyed background is my own painting as well; the entire composition is my own work. I would describe this piece as Contemporary, Modern, Abstract, Unique, and Fun. This piece is available for sale on ebay via auction format. Please click here to view the listing. The auction starts at 99 cents and there is no reserve. 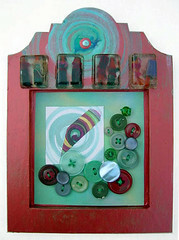 This is an original miniature painting in an assemblage picture frame. The work incorporates dyes, lumiere metallic paints and Polymer resin tiles with beads embedded inside. The frame was totally different until I altered it to become what you see here, although you can still see a bit of its original texture peeking through. The painting is my own original artwork, including the tiny spin painting on the top of the frame~ it is totally hand painted. The entire composition is my own work. I would describe this piece as Contemporary, Modern, Abstract, Unique, and Fun. Would be a fantastic decorative addition to your home, office, cubicle, or locker...would also make an incredible gift for someone special. This piece is part of my brand new "Youth" Series. Ready to hang, with a sawtooth hanger on the back. This is for sale via Ebay auction. Please click here to view the listing. The auction starts at 99 cents, and there is no reserve. Certificate of Authenticity is included. 18" x 24" unframed...entirely hand painted from my own metallic paintings on hand painted, hand dyed paper & then collaged together. 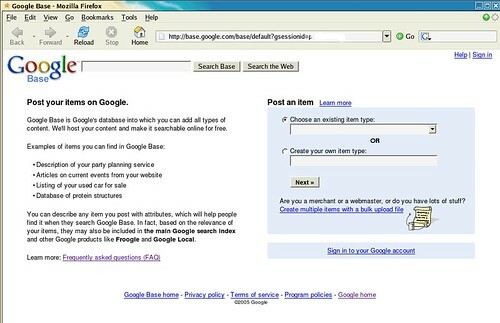 Google Base, originally uploaded by dirson. This is a screen shot that was apparently taken down, but it will be interesting to see what comes of this!!!! This is a mixed media Collage measuring 6" x 6". I incorporated dyes, lumiere metallic paints, sewing thread and vintage buttons on handmade/hand recycled paper and bristol board. The metallic paint is really sparkly and pretty, but it doesn't show up that well in this picure~ it's much nicer in real life. NOT FOR SALE~ I made it for a trade I am participating in with one of my art groups. :) Copyright 2005. 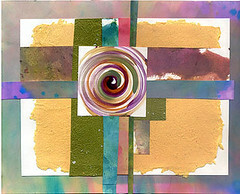 This piece was constructed by collaging together a variety of my hand painted, hand dyed papers. We just bought my domain name!!! You are welcome to go there & check it out, but right now it just redirects to my ebay store. Which STILL needs fixing up. I did just add a bunch of new books (well vintage books mostly) to the ebay store. Great crafty stuff...knitting, crochet, embroidery, sewing etc. :) I'm planning on listing a bunch more books & vintage magazines tonight and tomorrow too. Anyway I am almost finished designing my actual web site, so hopefully soon I can ditch the redirect and get it set up properly. YAY! I went to the post office today and shipped my ebay stuff out. I love doing that~ it always feels so good to know that everything is on its way to its new home. I really shouldn't even dare to complain about the rain considering our weather has been wonderful compared to everyone else's...however the rainy weather has put quite a damper on my plans to do some oil paintings. I do all my oils outside (husband has an ultra-sensitive nose!) I have 2 paintings that are in progress and I really want to finish them already!!! It looked clear awhile ago when I went outside to take some pictures but now it looks overcast again. But again, the &^*%!!! RAIN! I do all my spin painting outside too. I'd have to be nuts to do it inside because I end up splattering more paint on my surroundings than I do on my art. I am scared to go look in the garage~ our garage floods in the rain. I said I was going to stop making ACEOs for awhile, but I never said anything about not POSTING them in my journal- haha! I listed this one as a 99 cent auction with no reserve. You can click the photo above to view the auction listing if you are interested in more details. Thanks for taking a look! Of all the ACEOs I've done so far in this series, this one has the most stuff sewn on. It took me hours to do it but it's one of my favorites so far. Yesterday I made a botanical block, and block printed 10 cards onto my hand dyed papers. Then I accidently broke the stamp. :( Whoops. In the past I have purchased 3 different kinds of blocks- 2 different brands of the soft cut/ easy cut variety- speedball's & staedlaeter (I don't think that's really how you spell it?) plus regular old linoleum blocks. So far I've broken every single speedball block I ever carved within a few days of carving it. Needless to say I won't be buying those any more. So my 2 favorite botanical cards are the ones I posted pictures of. They don't look all that good in the photos because they are metallic and the shinyness doesn't convey well digitally. These aren't for sale- I gave them as free gifts to a customer who recently bought 2 paintings from me. I really hope she will like them. Original, one of a kind mixed media art. The bidding starts at 99 cents with no reserve. You can click the photo above to view the auction listing if you are interested in more details. Thanks for taking a look! "pure paper" (the backing is archival-quality- acid free, lignin free). Original art. Signed & dated on the back. The centers of the flowers are vintage buttons, which I sewed onto the card with thread.